The commissioning of challenging new work is essential in a genre that can at times feel safely, beautifully two-dimensional, and The Unusual Silence is a commission Grylls and Voices New Zealand can be thoroughly proud of. I have to say, for me Gallipoli anniversary fatigue set in a while ago – perhaps some time during last year’s Auckland Arts Festival – so it was with slight trepidation that I made my way to Auckland Museum on Saturday evening. 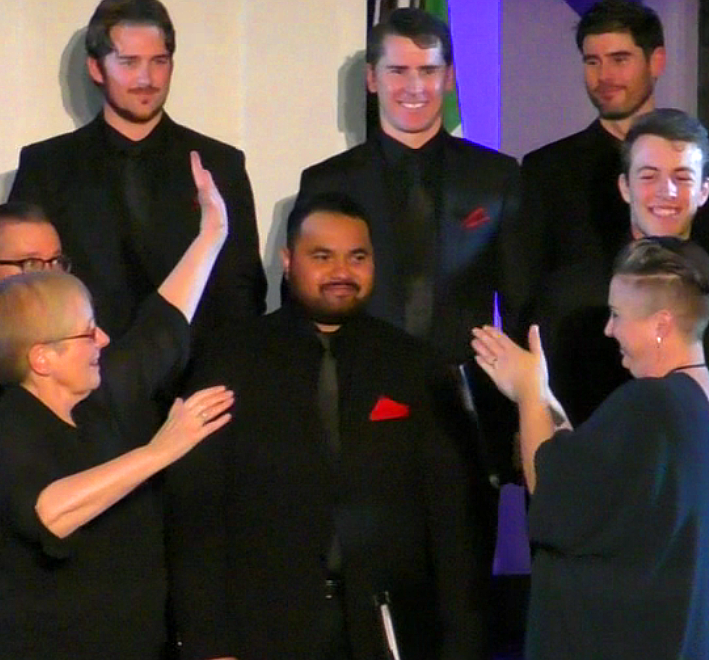 But Voices New Zealand promised an intriguing mixture of new and old, popular song and choral repertoire, and from the outset challenged the reverence we have come to expect from ANZAC events. The show began with the lusty patriotism of Keep the Home Fires Burning, which in the stark marble Sanctuary space felt weirdly sacrilegious. Such snippets of popular World War I songs were cleverly woven throughout the programme, from the patriotic (Oh! It’s a Lovely War) to the candid (When this lousy war is over). These numbers provided a tangible context for the rest of the programme, and gave individual choir members a chance to demonstrate their solo chops – Morag Atchison and Lachlan Craig were magnetic in Home Fires and This Lousy War respectively. Of the ‘classical’ offerings, both Healey Willan’s How They So Softly Rest and Eric Whitacre’s A Boy and a Girl were vehicles to show off the choir’s harmonic versatility and exquisitely judged phrasing. A Boy and a Girl has become a classic of the modern choral repertoire, with all the Whitacre hallmarks – unresolved suspensions, juicy voicings, added-note chords, rhythmic unison. A whole concert of this music would have become cloying, but the programme was finely balanced: against Whitacre’s neo-Romantic prettiness followed two contemporary New Zealand works that explored a more cynical attitude towards war and its commemoration. David Hamilton’s Suicide in the Trenches combined militaristic elements – a solo muted trumpet playing the last post, and relentless march rhythms mimicking a snare drum flam – with a sobering poem of Siegfried Sassoon. The almost jaunty straightforwardness of the musical setting seemed (deliberately?) at odds with the starkness of the text, but the point was made nevertheless. Conversely, Jenny McLeod’s Dirge for Doomsday employed a more complex, dissonant tonal language to match the unvarnished truth of the words: “remember the fire and the burning bone.” Written for the anniversary of the Hiroshima bombing, Dirge for Doomsday resolutely eschewed the glorification of war. Although Voices New Zealand is truly a well-oiled machine and the choral performances were uniformly excellent, they were hamstrung by the rather po-faced presentation of the whole event. This involved spoken monologues in between numbers, and for me the over-enunciated, radio-play approach jarred with the concert setting. I can appreciate that these small testimonies were a way to interlace music of sometimes disparate style and tone, but they came across as arch and awkward. One virtue of the spoken interludes was the clearly intelligible text, not always present in the sung material, despite the best efforts of the choir in a highly challenging acoustic. Even so, the Museum Sanctuary lent the concert an air of ceremony, and served the singers well in more voluminous moments. At the centre of the programme were two larger works by Finnish composer Jaakko Mäntyjärvi and New Zealand composer Victoria Kelly. Both showcased the textural and tonal possibilities of a capella choir to great effect, with Mäntyjärvi evoking the sea spray and foghorns of a naval disaster in Canticum Calamatis Maritimae. Pepe Becker’s crystalline soprano floated a wordless lament over the top of the texture while Gregory Camp imbued a Latin chant with groove and urgency. Despite textural complexities the piece had a satisfying sense of direction, its rich chromatic lines winding around and between fixed harmonic points. Where Mäntyjärvi’s composition employed text ritualistically, a heady combination of whispering, drones, vocalise and chant, Kelly’s new commission The Unusual Silence was grounded in concrete documentary artefacts. The composer had pieced together a rich libretto from official orders and propaganda, along with the personal reflections of soldiers killed during the war. The interplay between these two elements gave the work a powerful sense of tension, reinforced by Kelly’s apt characterisation of those twin voices of authority and introspection. From the explosive opening lines, “please exhibit in a conspicuous place” (referring to an enlistment poster) Kelly drew our attention to the cadences and rhythms of a peculiarly formal style of language, and the silences left between. There’s a danger with the remembrance of war that the music can get bogged down in solemnity, reverence or universalist platitudes. But Kelly’s patient, sustained pacing through the first two movements – the entire second movement built around a dogged pedal note – led to a shattering climax in the third. After a stern warning from some higher authority, “there is to be no cheering”, the pedal note – again sustained through most of the third movement – was finally released as we met the lush, apocalyptic vision of a lone soldier: “there was a glorious sunset”. The full force of Voices New Zealand, combined with a squadron of male high school students, made for a symphonic moment worthy of Sibelius or Elgar, a well-earned emotional payoff. After that searing moment of clarity, the final movement felt like a great textural haze, depicting the purgatorial swamp of unburied soldiers on the battlefield. There was uncertainty here, uncharacteristically from the choir, but also a compositional ambivalence, a resistance to easy solutions, a willingness to face up to mess. And yet there was something hopeful too, a lone soprano voice, shaky but determined, rising into the stratosphere. Although Kelly writes of her “sense of inadequacy” in doing justice to the subject matter, the nuance and sensitivity of her musical treatment, and especially her assured sense of form, served to lift the work above mere memorialising. Karen Grylls has long been a champion of New Zealand music, and particularly those composers who are not considered primarily “choral composers” – Ross Harris, Eve de Castro-Robinson, Leonie Holmes. The commissioning of challenging new work is essential in a genre that can at times feel safely, beautifully two-dimensional, and The Unusual Silence is a commission Grylls and Voices New Zealand can be thoroughly proud of. The concert ended with a tribute to the late Peter Godfrey, who had died earlier in the week aged 95: a movement from Jenny McLeod’s Childhood, There’s a Time to Live. ‘Prof’ Godfrey was hugely influential in the New Zealand choral community, and our wider music scene; the standard of our choirs today can largely be attributed to the tireless work of luminaries like him and like Karen Grylls. It’s remarkable that with so little public funding Voices New Zealand continues to produce work at such a high level.